Food fights and fan serviceâ€”what more could a fan want? Soma Yukihiraâ€™s old man runs a small family restaurant in the less savory end of town. Aiming to one day surpass his fatherâ€™s culinary prowess, Soma hones his skills day in and day out until one day, out of the blue, his father decides to enroll Soma in a classy culinary school! Can Soma really cut it in a place that prides itself on a 10 percent graduation rate? And can he convince the beautiful, domineering heiress of the school that he belongs there at all?! Having passed the first challenge of the stagiaire program, Soma moves on to his next assignmentâ€”working for Totsuki Institute graduate and former first seat Shinomiya at his brand new Tokyo restaurant! Excited by the challenge, Soma dives into the assignment hoping to find new ways to improve his cooking. 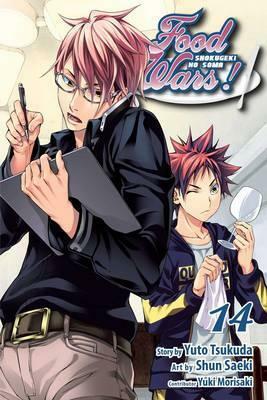 But the way Shinomiya runs his kitchen is unfamiliar to Somaâ€”only the best of the best stand a chance of keeping up! Does Soma have what it takes to pass this next challenge?